(L to R): Branden Kelly, Ryan Drew, Karem J. Simon, Kendall Perry, Michael Gallant. The UPEI Wind Symphony, under the direction of Dr. Karem J. Simon, will be performing a full recital of contemporary wind band music on Thursday, November 15 at 7:30 PM at the Homburg Theatre in Charlottetown. Following years of performances at local churches, the Wind Symphony is using Charlottetown's premier venue at the Confederation Centre of the Arts to provide its members, guest performers, and the audience with an optimal experience.The ensemble is in fine form and recent performances in Saint John, NB, and Summerside have been enthusiastically received. The centrepiece of the program is the Concertino for Four Percussionists by American composer David Gillingham. This work exploits the technical, expressive and sonic qualities of the Wind Symphony's extensive percussion section. Featured soloists include principal percussionist Ryan Drew and freshman Kendall Perry, who will be joined by UPEI music graduates Michael Gallant and Branden Kelly. The Wind Symphony's program will begin with Pulitzer Prize winning composer William Schumann's Chester, which is a setting with variations of an eighteenth century American Revolutionary hymn. 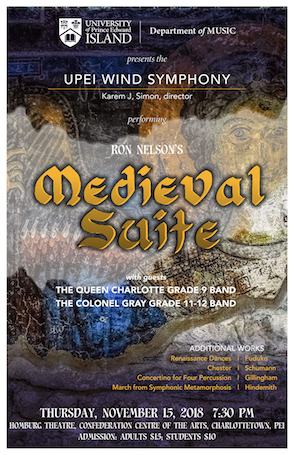 Medieval Suite, a work by another American, Ron Nelson, will follow. Here, Nelson captures the music of the 12th and 13th centuries while using contemporary harmonies, textures, colour, and minimalism. Thereafter, the Wind Symphony will jump a couple of centuries in its presentation of an elegant set of Renaissance dances by Japanese composer Yosuke Fukuda. Concluding this recital with be the March from Symphonic Metamorphosis by Paul Hindemith, a clever adaptation of themes by romantic composer Carl Maria von Weber. Comprised of UPEI music majors, the Wind Symphony has been critically acclaimed for its performance standard and innovative programming. During the past twenty years the Wind Symphony has produced an annual compact disc featuring selected repertoire from each year's performances. This has been a particularly busy semester for the Wind Symphony, which has performed collaboratively with school bands in New Brunswick and Prince Edward Island. Recently, the Wind Symphony performed the inaugural concert band recital at the new Celtic Performing Arts Centre in Summerside. For this recital, UPEI is delighted to share the opportunity of performing at the Homburg Theatre with two local bands: the Queen Charlotte Grade 9 Band, under the direction of Sylvia Andrew, and the Colonel Gray Grade 11 - 12 Band under the direction of Shawn Doiron. Tickets for this performance at $15 Adults and $10 Students may be acquired at UPEI, participating schools, and the Confederation Centre of the Arts box office.